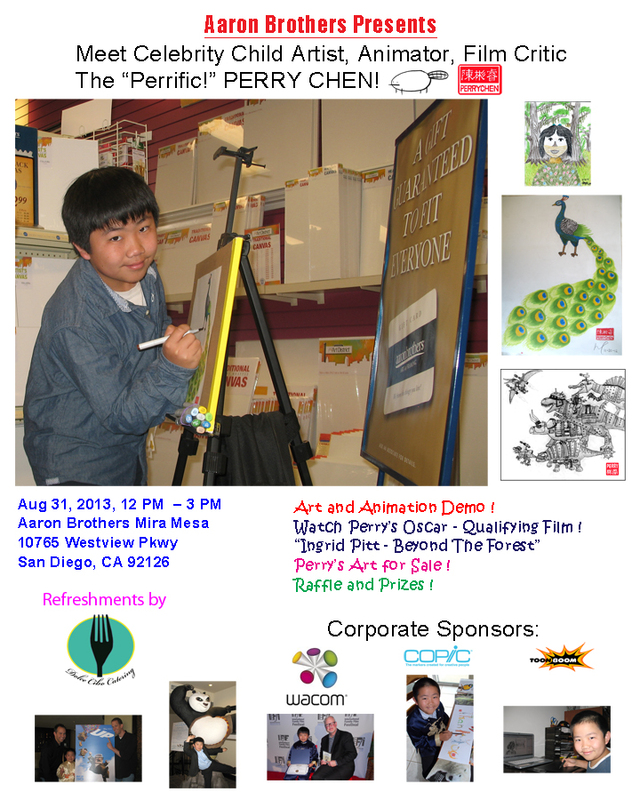 Aaron Brothers, the nation’s premiere framing and art supply company, is announcing a special appearance by Perry S. Chen, 13-year-old celebrity award-winning artist, filmmaker, illustrator, and film/entertainment critic at its Mira Mesa store in San Diego, California on Saturday, August 31, 2013 from noon to 3 pm. Perry will be signing autographs, doing art and computer animation demos using COPIC markers, Toon Boom Animation software, and a Wacom digital tablet, which are all corporate sponsors to Perry and the event. Perry will also share with the audience a trailer of his most personal, new animation short about his late father “Changyou’s Journey,” which he is writing, animating, and directing. He will demonstrate how to make art from commonly found materials, including tin foil and recycled objects. “When you make art, the only limitation is your imagination,” said Perry. This will be Perry’s first appearance at Aaron Brothers. Saturday August 31, 2013 noon to 3 pm. Select pieces of Perry’s art, including custom-designed greeting cards, posters, T-shirts, Perry’s multiple award-winning film, “Ingrid Pitt: Beyond the Forest”, and a parenting book “The Parent’s Guide to Raising CEO Kids,”featuring Perry, will be offered for sale. Perry will autograph his art and merchandise. Perry is the sole animator of “Ingrid Pitt: Beyond the Forest”, an Oscar-qualifying animation short in collaboration with animation legend, two-time Oscar-nominee Bill Plympton, produced by Perry’s mom, Dr. Zhu Shen. A video loop of Perry’s animation film along with Perry’s TV & film festival appearances, Hollywood director interviews, and other features will be shown at the store event. An additional 10 percent special store discount for all Aaron Brothers merchandises (on top of existing sales at the time) and raffle prizes including Aaron Brothers’ gift certificates, COPIC markers, gift cards from popular local restaurants that Perry has reviewed, including Sammy’s Pizza, Roppongi, and The French Gourmet, will be given out at the event. Everyone is welcome! Delicious refreshments for this special event will be provided by Dolce Cibo Catering. For further information about the event and partnering opportunities, please contact Rosemarie Bergdahl, General Manager, Aaron Brothers Mira Mesa (tel: 858-271-5314). For media interest and corporate sponsorship opportunities, please contact Zhu Shen, 858-761-7955, bioforesight@gmail.com . Perry S. Chen is a 13-year-old award-winning animator, artist, renowned film and entertainment critic, TEDx speaker, and entertainment personality, currently in 7th grade from San Diego. Perry is honored with the 2013 inaugural “iCON Junior Innovator of the Year Award” at 2ND Screen Global Con in August 2013. He won an “Excellence in Journalism Award” from San Diego Press Club in 2010 and 2011 for his movie and restaurant reviews, an “Excellence Writer Award” from “We Chinese in America” Magazine in 2010 for his movie review column. Perry is widely recognized as an authoritative spokesperson about movies for his generation, and appears frequently at red carpet movie premieres, press junkets, awards, and film festivals, interviewing prominent directors from such films as Wreck-it Ralph, Toy Story 3, Up, How to Train Your Dragon, Kung Fu Panda 2, and Despicable Me. Perry and his producer mom Dr. Zhu Shen are featured in a book about parenting and youth entrepreneurship, “The Parent’s Guide to Raising CEO Kids,” published in Aug 2011. 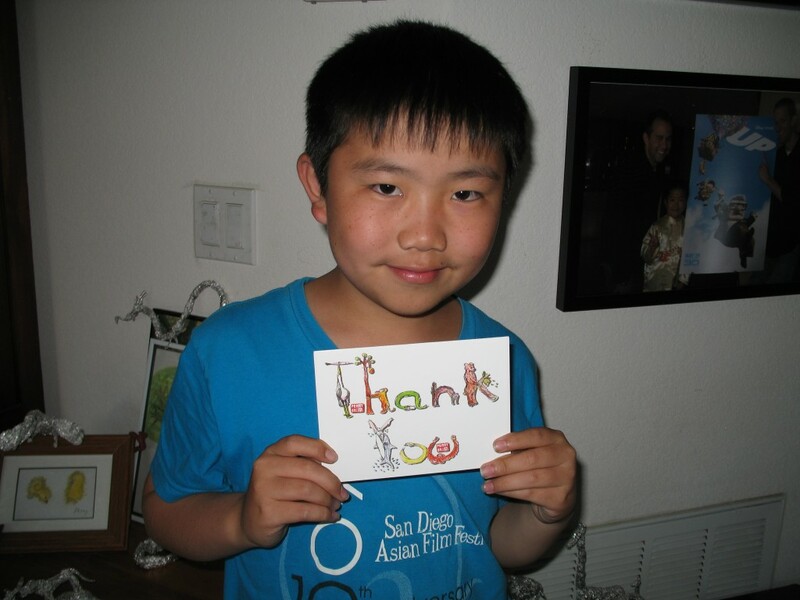 Perry-designed Thank-You cards with animal alphabet are currently sold at the gift shop of the Reuben H. Fleet Science Center in San Diego. For information about Perry Chen, media inquiries, and partnership opportunities, contact Dr. Zhu Shen, publisher of Perry’s Previews, email: bioforesight@gmail.com, 858-761-7955. Rather useful….looking ahead to coming back.